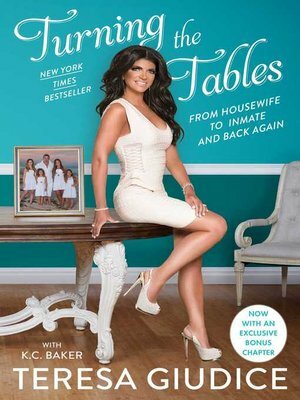 In her very first tell-all memoir, Teresa comes clean on all things Giudice: growing up as an Italian-American, starting a family, dealing with chaos on national television, and coming to terms with the reality of life in prison. Featuring scans from her coveted prison diary, Turning the Tables captures some of the most memorable moments of her stay, including the fights she witnessed, the awkward conundrum of being trapped when a fellow inmate had a...guest...over, and the strength she found while confined between four concrete walls. Now with an exclusive bonus chapter, Teresa reflects on the days following her December 2015 release, and the heart-wrenching weeks leading up to the night she had to say good-bye to her husband, Joe...who has left to serve his own prison sentence. Even at her lowest of lows, Teresa was able to live la bella vita by staying positive and realizing her purpose. Friends, foes, and fans have speculated about Teresa's life off-camera, but nothing will prepare you for the revelations she makes in this entertaining and ultimately heartwarming memoir. K.C. Baker is a staff writer at People magazine, where she has worked for the past fifteen years. Before that she was a staff writer at the New York Daily News. Turning the Tables is K.C. 's third book.